We've seen on-stage holograms, VR music videos and light-up wristbands at big shows and festivals but that could be just the beginning for tech invading the live music scene. One startup looking to get involved in the relationship between artist and fans is Peex. 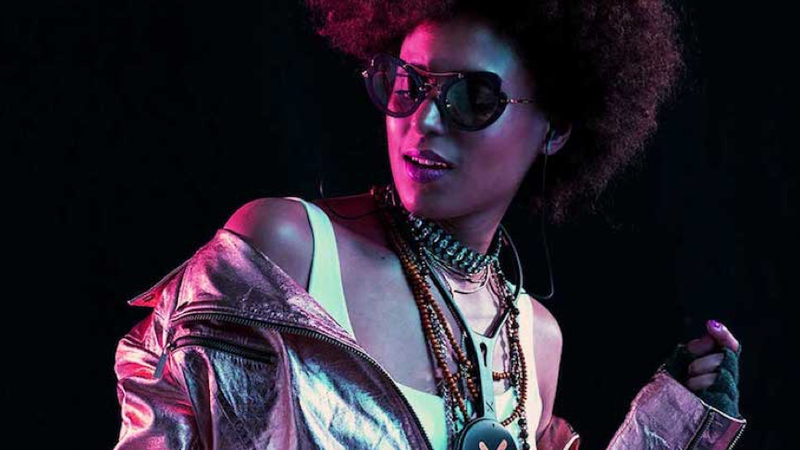 Its new music platform lets gig and concert-goers create their own mixes of performances, and the rX wearable lets you tweak the five channel mix while you're actually there. There's no price for the device or service yet, but it's been tested at 60 live shows so far and is set to launch in the UK, Europe and the US "soon". No less than Elton John is a fan – Peex has announced a partnership with the pop legend for his huge, multi-year Farewell Yellow Brick Road tour. Plus streaming service 7Digital is on board to offer post-gig downloads in the five channel mix for Peex users. "There's been a movement back towards old school, high-end music where you want good quality sound. This product is still for the audiophile first movers and fanboys," says Swift Creatives' Lars Christensen. "But if Peex manage to get the price right – why shouldn't this become a mass market appeal?" Christensen is a lead designer at Swift Creatives, based in Aarhus, Denmark who worked with Peex on the final design of the rX receiver. And it was a challenge. We asked him to talk us through some of the choices. The Peex rX's whole reason for being is to act as a receiver at a compatible live concert or gig, so the antenna was the most important tech element to consider in the design. "Peex had done some thinking and had an idea that it would be something you would wear somewhere," explains Christensen. "They weren't sure where you would put it, they had some ideas – put it on your arms, put it on your pocket. It would be obvious to put it in your pocket but then you'd have it a metre above ground, maybe in a venue where there's 30,000 people standing very close together. "We feared that the signal would be very poor and then you would pretty much lose the experience. It had to go somewhere high up. Given all these different aspects, we zeroed in on wearing it around your neck like a medallion would make sense." Unless the gig is a seated, sedate affair, people are going to be moving, dancing, bumping, grinding, jiggling and moshing with this thing on. And that informed the design too – the silicone lanyard is stiff so that it always hangs in the correct position (which also helps with the antenna issue) and also hides all the wires as they run up your neck. Swift Creatives and Peex also tried to make the rX as comfortable to wear as possible. "We were adjusting the headsets to make sure you wouldn't get tangled in a shedload of wires, jumping up and down, then trying to get all those nitty gritty details into the final design to make sure it would be a flawless experience the first time you put it on," he explains. "We had a clip idea as well where the lanyard is still a one piece mould and it holds the medallion, so you could pop it out. The idea was originally that it would also be a clip, that was unfortunately removed during the process, so you had a few more options to wear it. It ended up being only a lanyard. "Of course if you jump around too much and it's on the outside of your jacket, if you're really good at jumping, it could potentially hit you in the chin. I don't know if that's actually going to happen, it's not that heavy. I don't see anyone coming to harm." If you've been following the rise and rise of hearables, you'll know that live mixing of gigs isn't entirely new – Doppler Labs, makers of the Here One wireless earbuds (RIP), made this part of their augmented audio feature set. And Christensen did float a hearable based option for the Peex rX. "We just did a wireless in-ear for Libratone that's about to be launched, there's a lot of these at the moment, they're quite popular in the Asia Pacific," he says. "It's wireless but you have a rubber shaped pod that lies on your shoulder, on your neck and then the in-ears go up. We had an idea to do it somewhat like that, if you could distribute batteries and everything then you would have the antennas in an even better position and you could mould them, they stick quite well to the neck even when you run or jog or jump. "But the engineers were a bit afraid since it was the first off with the mechanics, they were afraid of making it too flexible – in terms of could it actually hold in the long run. And when it comes to that, the engineers have a bit more to say than we do as designers. We do win from time to time. In this case, software and hardware stability was key." Christensen is already thinking about what Peex rx version two could look like – some obvious tech spec enhancements such as wireless earbuds and others that have more to do with the live gig environment. "Further down the road, the in-ears might get wireless and you'll have other ways of wearing it. But first off, this super crazy technology, of course, making sure that it works flawlessly the first time was the issue so therefore it's cabled in-ears," he says. "Of course we had other ideas and other shapes in the design process. There were ideas about adding leather straps to make it more high end or being able to customise it, that's definitely something that's gonna come, I'm pretty sure about that." Swift Creatives has also talked to Peex about what could come next, Christensen says there is a movement right now for this type of product. "We've talked with Peex on what could be incorporated in the next product because there is a lot of stuff that quickly pops to mind – lights that you control from the stage, customisations etc. There's a lot of cool stuff that you could put on in the next product that could bind the artist and the fans even closer together in a unique experience."